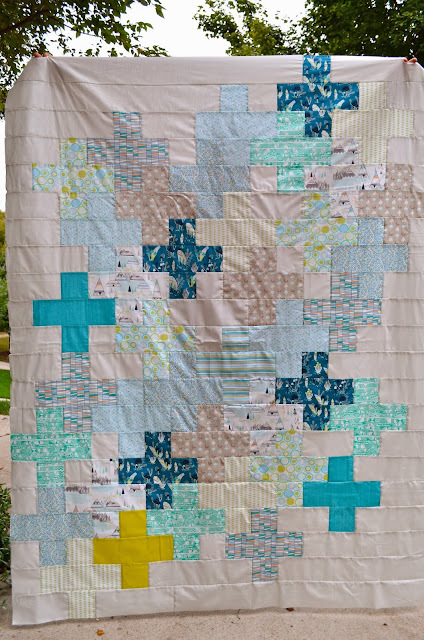 As soon as I saw a glimpse of Susannah Kate's new quilt pattern Cascade, I jumped at the chance to be a pattern tester. I knew I wanted to use my bundle of Indian Summer to make a super soft quilt that would really showcase the fabric! I have always wanted to make a plus quilt (my mom thought that meant a really large quilt, so I will clarify that I mean the plus sign you see in the design!) but never really wanted to figure out the math. I love how this pattern uses negative space to make a really interesting design! Add to that the fact that you use 10 fat quarters with minimal waste and a yard and half of background fabric and can get everything cut and organized in an afternoon nap and I am sold! Cascade quilt pattern and has such cute pictures! We are all “Instagrammers” and have a wonderful feed under the hashtag #cascadequilt . You will find more wonderful examples of the Cascade quilt including a beautiful one made with all solids! Include your own Cascade quilt – We’d all love to see it! You can buy the pattern here and leave a comment for a chance to win a copy! Tell me anything, what you are being for Halloween, what your favorite candy is, what you're sewing, etc! It's beautiful! I love your mostly low volume approach. I love plus quilts & yours is beautiful. I'm trying to get 3 donation quilts finished before next Monday. The tops are done & I've quilted one but still have to bind it. Thanks for the chance to win. Very pretty quilt. I am currently making pants, shirts and pajama pants for my two grand kids. They grow out of them faster than I can make them. Fabulous - I've been wanting to make a plus quilt for ages! Currently I'm making a bag for my sister's birthday! Love your version of this quilt. I am wanting to make a plus quilt for my son so it would be wonderful to have a pattern instead of trying to work it out for myself! beautiful quilt! i love the soft colors you chose. Great quilt. Love the fabric! Happy Halloween! I think your quilt has been the most unique one so far. Love your version, Courtney! I've been sewing a swap project- a Christmas throw quilt! Oh, and my favorite Halloween candy . . . gotta be Reese's Pumpkins! 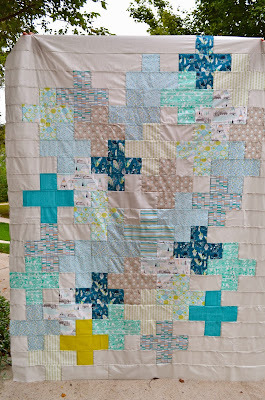 I love plus quilts and I especially love how gorgeous this one is. You did a fantastic job with fabric selection too!! what a very pretty quilt. I love the one yellow plus. I would love to make one of these some day. At work I am going as Cinderella. old patched dress with an old patched apron and a bandana head cover on my head. Using old sheets that I have. I don't eat candy anymore but I love candy corn and reeces peanut butter cups. I actually finished a quilt last night! Took it out of the dryer this morning. Nothing better than a finished project and before the deadline lol! I love your quilt!! I am working on some christmas projects for gifts. Thank you for the giveaway. This is such a cute design! I think I need to put it on my "quilt list" to make for my youngest nephew. Right now, I am working on several different sewing projects - most as gifts for the holidays and some for myself. Thanks for the chance at a giveaway! I've always loved that fabric! I'm not dressing up for Halloween, but my 4year old daughter wanted to be the Charlie Brown ghost. Very funny! So, so beautiful! Love the fabrics - and that's hilarious about "plus" size - I can totally see why she thought that! This is a great pattern. And what I'm sewing?? Susannah Kate's Circle 7! I have a Reese's addiction...um...affection. I love your fabric choices. My 10 week old granddaughter is going as a scuba diver- black onesie, black tights, water bottle oxygen tank with tubing attached to a paci. I have to say- it's pretty cute. Your quilt looks wonderful! I'm currently trying to finish a quilt I'm making for my cousin's wedding which is next weekend, it's going to be a close call! Thanks for the chance to win. 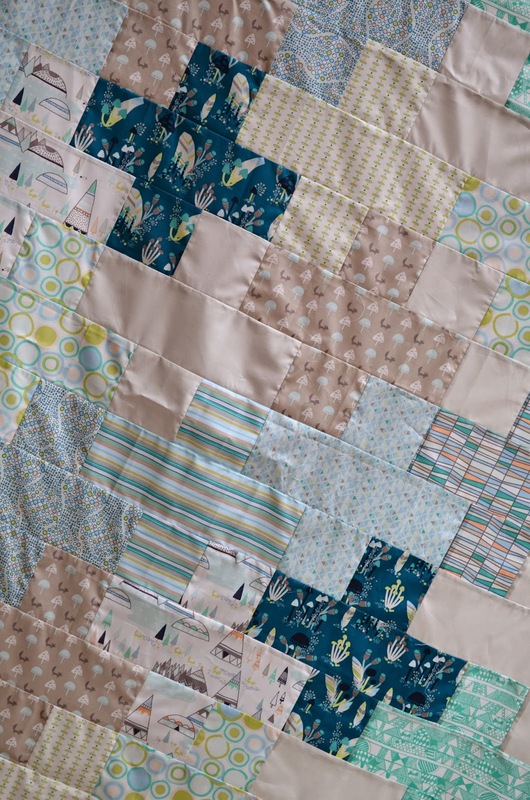 This quilt is beautiful and I really like the way the plusses are made from strips. That's worth a try. I'm knitting right now, almost no sewing, but my fingers are itching. Very beautiful and I love anything with minimal waste :) I am sewing a backpack for my daughter. This is beautiful. I like the plus quilts, but I really like the variation on this one - the way the background has it's own thing going on outside the plusses. Great! I'm trying to catch up on the penny sampler - it's hard not to lose hope, but I'm pushing forward. I'm super excited because I just finished my log cabin pumpkin Table Runner! My goal was to finish it before November! Thanks for the chance to win! Love your quilt and the pattern! My little guy 1 1/2 year old was a fireman for Halloween. Love your quilt, I want to make mine in greens and purples. I love this quilt! I have decided to make a plus quilt for my new niece or nephew due in February. It looks beautiful. That's a really fab pattern!